A new restaurant, bar, cafe, and private event space in the neighborhood. 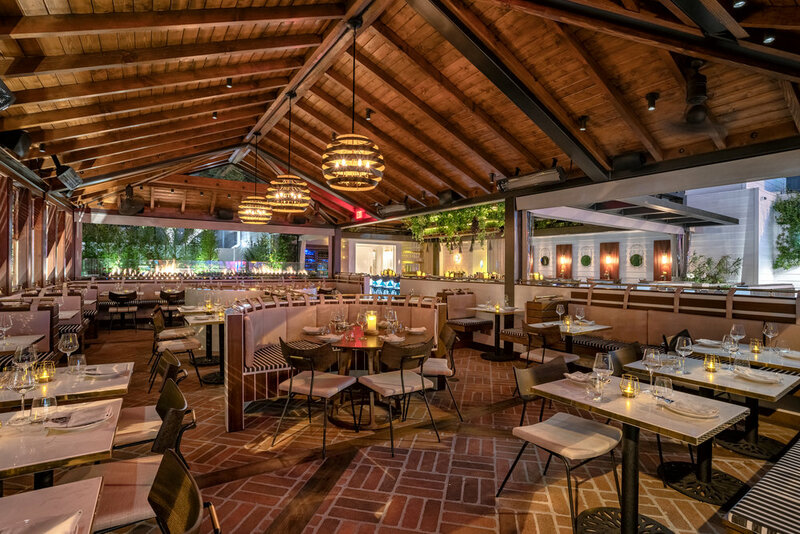 Developed by The Kalt Group, with design and concept creation by Jim Hustead of Age Old Trade Design, Conservatory is built to host a vibrant and social setting in the heart of West Hollywood. With something for everyone, Conservatory is a multi tiered space with a street level café, Café at Conservatory (housed in the historical landmark previously occupied by Queen’s Burgers and Irv’s respectively), a full restaurant and bar on the main floor, and Society Room, a back room offering an elevated cocktail program. 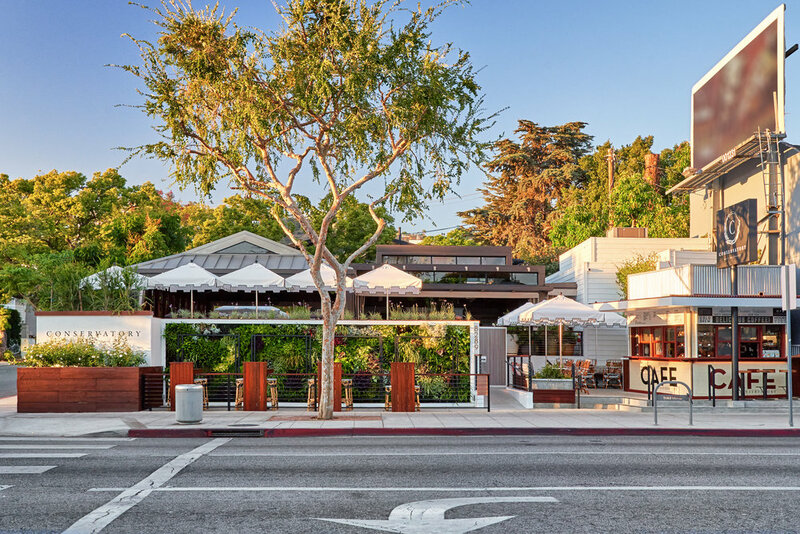 Conservatory features an ingredient driven, seasonal California menu. Guests can look forward to a varied menu with items including Fall Squash Bruschetta with apple, endive, burrata and pumpkin, Pei Mussels with calabrian chile butter, white wine, soft herbs and grilled bread, Braised Short Rib with fontina polenta, charred broccolini, gremolata and watercress, and a Bacon Cheeseburger with an 8 oz beef patty, swiss cheese, dijonaise, pickles, applewood smoked bacon and shredded Iceberg lettuce. Also featured is an international wine list, with all wines available by the glass, driven by General Manager, Alessandro Silvestri. The Café at Conservatory: The Café will serve Verve Coffee offerings, pastries from Bakers Kneaded and will feature “The Spritz Trail”- with selections of amaris from Italy, Switzerland, France and the United States. Each will be crafted with sparkling water, prosecco and served with an orange wedge and a castelvetrano olive. Conservatory’s Main Bar: Conservatory’s Main Bar will focus on well-sourced ingredients, seasonality and classical technique. The main bar features a garden of fresh mint and other herbs displayed over the bartender’s heads to pull from and use in the guests cocktails. Cocktails from the main bar include “Fellini was like a Watermelon” with Campari, Dr. Zzyzx Rose Vodka, yellow Chartreuse, watermelon juice and grapefruit Radler , “Kevin Lee Light” with Comice Pear Absolut vodka, Sauvignon Blanc, grapefruit and lemon juice and honey and “Kangaroo in the Orchard” with Absolut vodka, vermouth de Chambrey blanc, apple schnapps and grapefruit oil. Society Room: Society Room is dedicated to the art of the bar and the art of the bartender’s craft. Building on the Main Bar’s focus on ingredients, seasonality and classical technique, Society Room will offer a slightly more curated experience, including modern techniques, specialty service pieces and an artistic flair. Examples of the cocktails offered in Society Room are “Miso-Wari” with Red Miso & maple butter Coffey grain Nikka, lemon, amaretto, pear eau de vie and charged water, “Mayan Sharona” with Cocoa Butter Altos Reposado, lemon and lime juice, Suze, orange flower water, and chocolate bitters and “Cloudy with a Chance of Apples” with Nigori Sake, strawberry Altos plata, honey, tamarind and Rekorderlig spiced apple cider. A bespoke sense of quality echoes through the restaurant with a sense of a “get away”, featuring spectacular details throughout each room from open/shut shutters in the main dining area to an open-air café with a living wall on Santa Monica Boulevard and Society Room giving way to a room with a private feel with pink and green flair and artistic touches throughout. 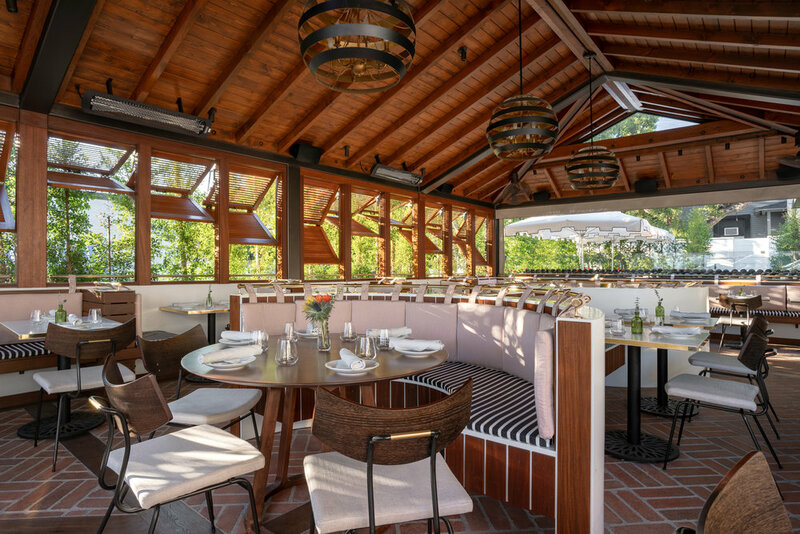 Adding to the Conservatory atmosphere is an open-air lounge and fire pit area, where guests can enjoy cocktails and bites in a cozy setting. Copyright Conservatory & The Kalt Group, all rights reserved. Conservatory is committed to making our website's content accessible and user friendly to everyone. If you are having difficulty viewing or navigating the content on this website, or notice any content, feature, or functionality that you believe is not fully accessible to people with disabilities, please call us at (323) 654-0020 or email our team at info@conservatoryweho.com, with “Disabled Access” in the subject line and provide a description of the specific feature you feel is not fully accessible or a suggestion for improvement. We take your feedback seriously and will consider it as we evaluate ways to accommodate all of our customers and our overall accessibility policies. Additionally, while we do not control such vendors, we strongly encourage vendors of third-party digital content to provide content that is accessible and user-friendly.